My son, Andrew, is 8 years old. He loves pancakes, trains, playing the piano, and reading. He is a healthy and happy boy. A few weeks ago, he walked into my home office to tell me goodnight. It was late, and I had been working in my office pretty much all evening. He looked at my laptop's display and asked, "What ya' working on?" On the screen was a spreadsheet full of column after column, and row after row of numbers. Lots of numbers. To him, I’m sure it made no sense at all. I had been staring at it all evening, trying to work out a few tricky formulas, and was getting frustrated. I felt bad for ignoring my family all evening, too. I needed a break. So, as Andrew stood next to me and stared at the spreadsheet, I asked, "Do you know what your daddy does for his job?" I suppose I expected him to say something like, "You work on computers." Or, "You and Northwoods build Apps!" (He KNOWS all about apps...99 cents at a time). I also somewhat expected him to say something like, "You work on stuff that makes you sit in your office all night." Or, "You take airplane rides to faraway places, and have to sleep in hotels a lot." However, he said nothing like any of that. Without hesitation, he said, "You help the people, who help the people, who need help." Turns out the kid remembered that sign, and remembered our conversation when he asked what it meant. I had explained to him there are people in the world who are not as fortunate as us who sometimes need help. 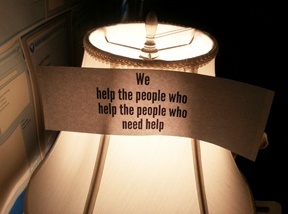 And that there are lots of very good people in the world whose job it is to help those people who need some help. I told him that Northwoods builds software for those helpers and teaches those helpers how to use our software so that their very important job of helping others is a little bit easier for them. He remembered that sign, and he remembered that conversation. What had been a simple and mundane "goodnight dad" from my son turned into something so much more. Not only does Andrew understand what I do, he also knows why. Andrew knows why Northwoods does what it does, too. What we do here is not easy. Nobody has ever done what we are doing here at Northwoods. Doing things that have never been done before is supposed to be hard. Otherwise, it would have already been done...by someone else. Despite the ups and downs, despite the aggravation and seemingly never ending challenges we face here at Northwoods, and despite my frequent exhaustion at the end of too many days, I am comforted in knowing that my son understands why. For him, when he thinks about his daddy's job, he doesn't think about working late or business trips. He thinks about helping people. Rich Diers is Chief Technology Officer at Northwoods, and leads the Black Bear Opps group with the sole mission to create really awesome technology for social services agencies to help the people, who help the people, who need help. You can follow Rich on Twitter at @richiediers. When Northwoods Chief Technology Officer Rich Diers asked his 8-year-old son to describe his job, he got an inspirational answer.